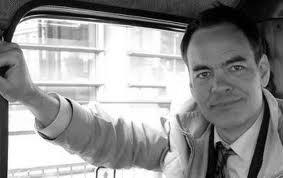 "Max Keiser rips the financial markets apart like a hand grenade in a house made of peaches"
Max Keiser has labeled JP Morgan "the biggest financial terrorist on Wall St", in relation to their alleged manipulation of the price of silver. RAISED: New Rochelle, New York, USA. Currently Living in Paris, France. He is known for making accurate predictions: In the September 2004 issue of "The Ecologist" magazine, Keiser correctly predicted the 2008 collapse of Fannie Mae and Freddie Mac (mortgage association and loan corporation) when he wrote, "My guess is that the two stocks that look the likeliest to implode at the hands of derivative-wielding Wall Street financial types (and other fundamentalists) preying on a US economy made weak by cheap money are Fannie Mae and Freddie Mac." 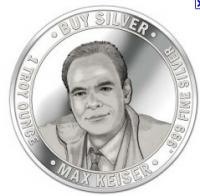 Yes, there is even a Silver Keiser (Max Keiser Silver Round) made after him. He is passionate about exposing the market frauds of our times and believes silver is sound money for the people. "We will see a shift in power away from the US, and towards the developing world - to countries such as Brazil and the Gulf states that have commodities to sell, and to China, where the savings ratio is high. We are going to see a new world order. America as a driver of the global economy is finished." This global campaign has surged through independent media and is helping to wake people up to value of owning physical silver. He is now known in some circles to be head of the Silver Liberation Army and one of the main Silver Vigilantes. Is the US Dollar a fraud? Is the silver market being cornered? Whats up with the Crash JP Morgan Buy Silver Campaign? To get right into the JP Morgan story, start at 7:00 mins.